Jerry Falwell blames global warming on Satan. Well, actually, he blames Satan for using the ruse of global warming to distract Christians from their true mission of evangelism. Speaking to his congregation in Lynchburg, VA, last week, Falwell said that even though some Christian leaders have been "duped" into believing the "science" of global warming, "the jury is still out" on whether humans are causing, or could stop, global warming. He added that the Bible teaches that God will maintain the Earth until Jesus returns, so Christians "should be responsible environmentalists, but not first-class nuts." And since every good speech is rounded out with a good joke, Falwell finished up with this zinger, "'An Inconvenient Truth' should have been titled 'A Convenient Untruth.'" This is good news. God is taking care of the earth, so we can relax a little bit. I just threw 12 styrofoam containers full of glass and old hypodermic needles out my office window onto an elementary school playground. No worries! Jesus has it under control. It is a little strange because previously Jerry Falwell has stated that "The whole (global warming) thing is created to destroy America's free enterprise system and our economic stability." So which is it? Is Satan using global warming to distract evangelism or is he using it to make America poor? Or maybe both at once? Maybe the basis of evangelism is to promote America's free enterprise system? That can't be right. Jerry Falwell boggles the mind. 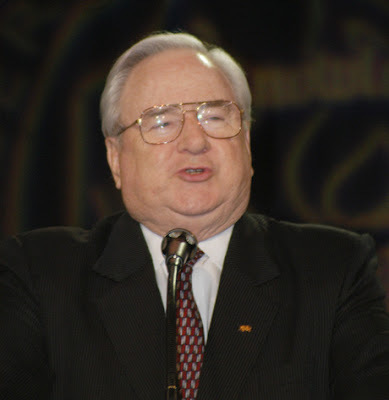 Jerry Falwell on 9/11: "I really believe that the pagans, and the abortionists, and the feminists, and the gays and the lesbians who are actively trying to make that an alternative lifestyle, the ACLU, People For the American Way, all of them who have tried to secularize America. I point the finger in their face and say 'you helped this happen.'" "Fred Phelps does not give the religious right a bad name, because nobody claims kin to that guy." Jerry needs to brush up on his beatitudes. It bugs me when Christians are big haters. Did they miss all that stuff in the Bible about turning the other cheek and loving their neighbors and stuff? This is why I can't be Catholic anymore. The trick to disregarding the Beatitudes is to always see yourself as the victim. Christian Nationalist Fundies like our dear friend Jerry (God Bless him,) excel at revisionist history which gives them access to revisionist reality. They honestly believe they are being oppressed by the Great and Mighty Homosexuals who have all this power and use it to subvert family, nation and God (read "country, home and mother" or "apple pie" as you see fit.) They have gone so far as to have home-school text books that teach that homosexuals were behind the Holocaust, not victims of it. They do the same for any group they feel the need to hate. If you are always the victim, you are always meek and blessed. If your enemy is always the tyrant, than it is you who shall inherit the Earth (sooner rather than later, preferably.) There is also some interesting historical caveats to the “turn the other cheek” business that I’ve heard; I’m not sure if they are true or more propaganda, but they imply that Jesus wasn’t as passive as he was subversive in making that recommendation. I had forgotten about that 9/11 quote. Nice to be reminded that some of us were a little late to the "We're all in this together" approach. I'm just trying to get past the inconsistencies in his reasoning on environmentalism. Ok, so God's got the environment under control, so don't sweat global warming. But then, why even bother telling people to be "responsible environmentalists?" I mean, God's on it, right? Why, it's almost like he's paying lip service to the whole issue! Now that he brings it up, though, I've got a theological question I hope Rev. Falwell addresses. Who is going to suffer more in hell - the evolutionary biologists or the climatologists? Jono, I just ran across this: http://hhhknights.com/curr/human/2/hellinferno.html. Looks like it would depend on whether you consider evolutionary biologists and climatologists to be "Epicureans," "Violent against God and Nature" or "Fraudulent Counselors." I think the most charitable option you'll get out of Jerry would be "the just people who never knew Christ" but considering this recent statement, doesn't sound like that's what he thinks of the climatologists at least. Man, to hear Dante describe it, Hell sounds pretty unpleasant. This should really be required reading for introductory science courses...I had NO idea what I was getting into.